Here were are again with this week's completed section of the #spiceoflifecal. 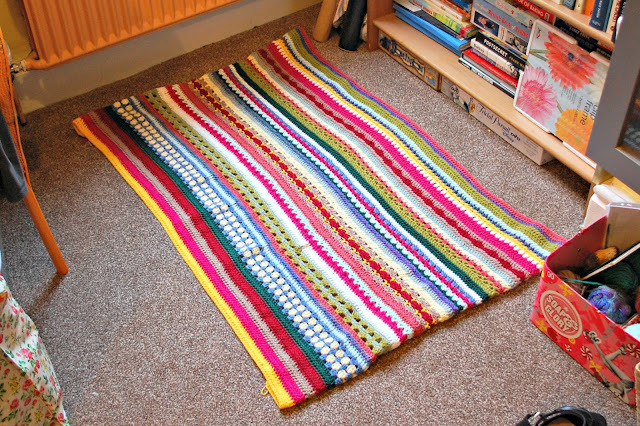 Remember, this is the blanket CAL hosted by Black Sheep Wools and Sandra, and is a challenging and colourful project! You can read all of my blog posts about the spice of life CAL here. Wow look at how the blanket has grown already! It is getting trickier to photograph I don't mind telling you. It's actually a few inches wider than it appears on the picture, perhaps you can spot where I tucked the edges under to try and hid all my loose ends (not looking forward to weaving those boys in). I don't know specifically, but I think the blanket pretty much doubled in size from where I was last week, which meant there was a lot of crochet to get done in part 4. 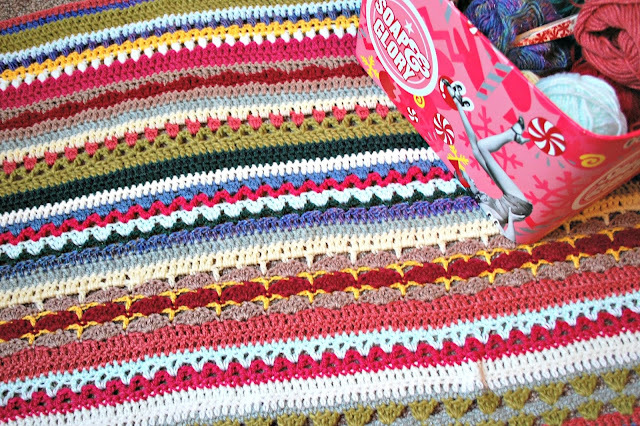 I didn't mind though, I treated myself to many hours of crochet in bed on Saturday and Sunday, while (finally) watching the final series of Parks and Rec with Ben. A very good way to spend a weekend if you ask me. There were 4 new stitch patterns to contest with this week, including 'TULIPS', 'WAVES', 'FILL THE GAP' and my least favourite to do, 'PUFFS'. Man, the puffs were hard - you end up with 7 loops on your hook, where normally 4 is the number I blanch at. The puff rows took the longest and the most concentration, but they were worth it (I will begrudgingly admit) because they make very thick, cuddly rows. I have a feeling more will be coming soon ... at least I have the practice down. 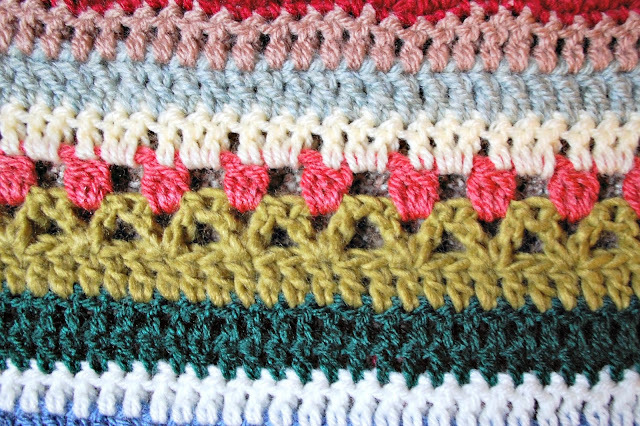 My favourite stitch this week is easily the tulips. Even though I'm using stash yarn, I stuck to the colour instructions as closely as I could for this stitch, because (you guessed it) the finished row looks like a row of tulips! I think they look so sweet, and blend in nicely with the rest of the blanket. When the recipient gets this blanket come December, I hope they will have fun investigating the rows and will smile when they stumble across the tulips. 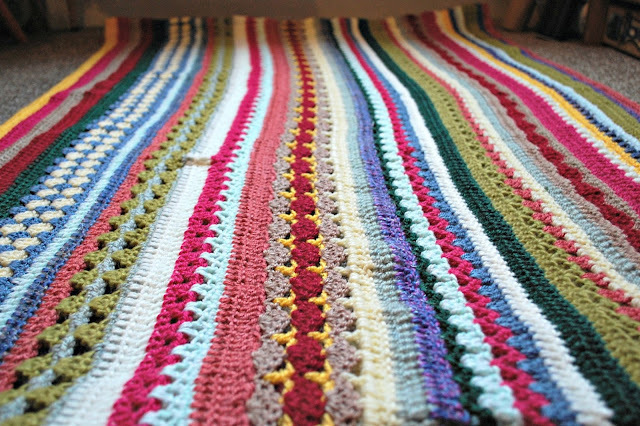 And although I know it isn't a race, I did set myself the challenge to finish this blanket by the end of the month, so hopefully I won't be falling behind any time soon! If you are taking part in the CAL, please do say hello! Currently Reading Bedknob and Broomstick by Mary Norton. I would think a lot of you reading this will know the Disney live action/animated film, with Angela Lansbury, and I am no different! It was one of my favourite films to watch and re-watch on video growing up (I don't even have this on DVD yet!) and I found this book amongst mum's old things, and I've had it on my shelf to read for a long time. I must say, it is very different to the Disney film. and is actually 2 short stories brought together in one book. I think if you are looking for an easy, nostalgic read, this one is worth a go, but it does not have anywhere near the same level of excitement that the film does, much like when Disney did Mary Poppins.